The death warrant for the Chevy SS will be signed in 2017. 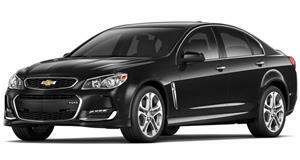 It’s not news that the Chevrolet SS is dying off. What we didn’t know is when it would die. Like FCA with the death of the Dodge Dart and Chrysler 200, GM hasn’t been forthcoming with an execution date. At the 2017 Detroit Auto Show, WardsAuto caught up with General Motors’ North American president, Alan Batey, who confirmed that the SS would die out “by the end of the year.” The move will coincide with the end of Holden production in Australia. Batey did not speak to a replacement for the SS or its NASCAR counterpart. If you’ve been paying attention to the auto industry you already know that a successor isn’t coming, direct, spiritual or otherwise. A V8 performance sedan isn’t exactly a volume seller. That’s a shame because the Chevy SS is one of the most underrated cars of our time. But GM’s future, like every other automaker’s future, is in crossovers. The Corvette ZR1 didn’t debut at Detroit but a redesigned Chevy Traverse and GMC Terrain did. Both of those SUVs will sell more units in a month than the SS did in its entire lifetime; the SS has done 8,805 sales since its launch in 2013. Here’s hoping Chevrolet decides to send the SS out with a bang in 2017. A special edition with a tuned engine and some aero bits would be a fitting sendoff.